Dwarves are the perpetual angry side-kick of the science fiction world that act as the muscle of the group or the keepers of the forge and are never really cast in anything more than supporting role. 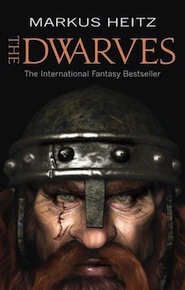 Markus Heitz changes all that with his book Dwarves which makes the main story about this group and takes the reader down into their world. In Dwarves, we join a dwarf foundling named Tungdil on an epic journey of adventure….and losing your virginity. Tungdil is a dwarf who was raised by a human – a magus or sorceror, specifically. Tungdil’s master was one of a handful of sorcerers that protect the land of Girdlegard which is described as being almost like a bowl with mountains surrounding most of it. Living in this land are the normal characters of a good science fiction novel – elves, humans, orcs, gnomes, trolls, and the Afar. The sorcerers protect Girdlegard from lands known as The Perished Lands. This is a desolate place where anything that does on its soil returns as…well… as a zombie (Heitz calls them revenents). They protect this land by lending their magic to a protective shell that encloses Girdlegard and does not allow anything from The Perished Lands to enter. The action starts when Tungdil is tasked with returning some items to his master’s colleague. While he is away, his master is summoned to a council that is being convened to deal with the rising threat of The Perished Lands. While at this council, a fellow sorcerer betrays the group and his actions let in the bad guy, a dark magus named Nod’onn whose focus is on pushing The Perished Lands into Girdlegard and the rest of the world. Tungdil is pulled into the action when he hears about what is happening and realizes he must protect the people that raised him and the lands that he calls home. All of this, while meeting the first of his kind and learning what it means to be a dwarf. The story keeps you engaged even though you discover about a 1/3 of the way in that you can pretty much predict the outcome. It is refreshing to get a taste of the dwarf as a hero and to experience their world as more than just a “pass through the mountains” or as the drunken, fighting side kick. Heitz does a great job keeping with the basics of the dwarf and adding to them without completely changing them. He even introduces female dwarves – which I’m not aware of any other mainstream sci-fi writer that has done that. There are some truly memorable characters, like Ireheart and Rodario; but, for the most part the character development is pretty tepid. Tungdil is not as developed or complex has he could have been; however, neither was Froto Baggins. There was opportunity to develop some of the other characters, but it never really happened in a way that melded together for me. (Reviewers note: I won’t get into my dislike of Frodo Baggins here, but suffice to say he is on my short list of science fiction characters I can’t stand). Overall, the book is good. It isn’t a complex, hearty meal but it keeps you interested even though the plot is somewhat predictable and the characters are a little on the light side. I thoroughly enjoyed it and plan on reading the rest of the series as soon as I can get my hands on them!